Bruce Smith was known as “The Sack Man” of Virginia Tech football. He finished his college career in 1984 as the most honored player in Hokie history at the time. As a Tech player, Smith had a career total of 71 tackles behind the line of scrimmage for losses totaling 504 yards. 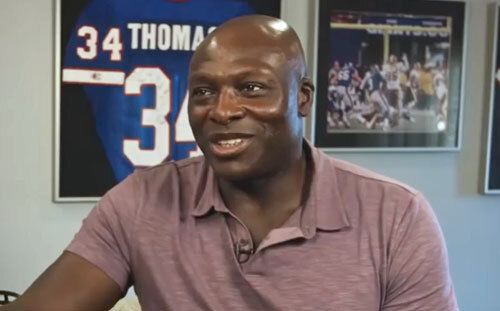 After attending Virginia Tech, Bruce Smith was drafted by the Buffalo Bills as the number one draft pick overall in the 1985 NFL Draft. Smith became known as a sack specialist, with 15 in 1986 and a personal season-best 19 in 1990. After the 1999 season, Bruce Smith signed with the Washington Redskins as a free agent. In his first season, he posted 58 tackles and 10 sacks. PFP Sports & Celebrity Talent Agency is a booking agent for motivational sports speakers and celebrities. If you would like to book NFL speakers like Bruce Smith for a speaking engagement, personal appearance or special event, you can request Bruce Smith agent and speaker information from PFP Sports & Celebrity Talent or call 800.966.1380.